When the warm weather of the spring and summer seasons arrives, you might want to begin planting a garden with vegetables that include green beans, squash, and tomatoes. There’s a simple trick to growing tomatoes that doesn’t always start with the seeds. You need to get a large pot and some dirt to start growing your own little plants from tomato slices. 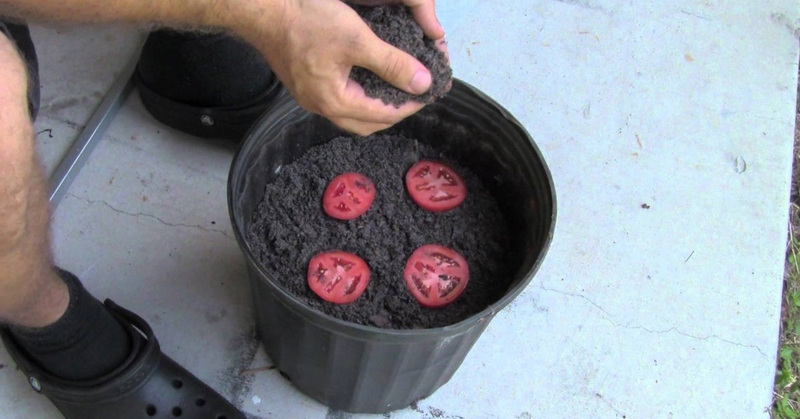 This is an easy method of growing tomatoes that takes no time at all. The first thing that you’re going to do is fill the pot a little over half way with the dirt. Make sure the dirt is rich in nutrients so that it provides everything that the tomatoes need to grow. Slice a tomato into about four or five slices. One that’s a little overripe works best for this project. Consider some of the tomatoes that you would normally throw away as these would be ideal for putting in your pot. Put the slices on top of the dirt, covering them with more dirt until they are just covered. You can press the slices into the dirt just a bit so that they don’t move around. You need to water them at least every other day so that they will have plenty of moisture. After about two weeks, you’ll notice seedlings that are starting to grow. This is because tomatoes usually have small seeds in them, which is how the small plants will begin to sprout. Once they’ve grown to a sufficient height, you can put them in the ground.